Travel to Libya is ill-advised at the moment due to the ongoing civil war. And that’s a shame, because this beautiful land has much to offer the intrepid traveller. One of the largest countries in African, Libya boasts a stunning Mediterranean coastline, gorgeous desert landscapes and no fewer than seven UNESCO World Heritage Sites. 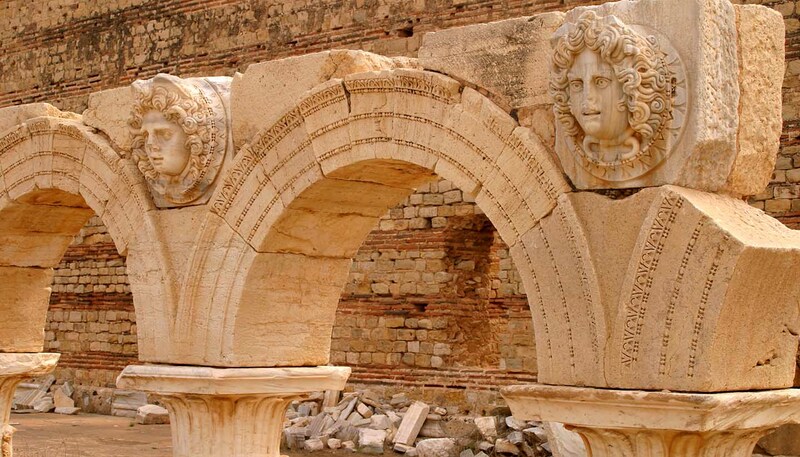 These ancient sites are a reminder that Libya’s history has always been tumultuous: before Gaddafi’s regime and the ensuing civil war, the country endured Greek, Roman and Italian rule. But Libya has more to offer than war stories. From the mystical desert town of Ghadames to the stunning Sahara Desert, this is a land of empty beaches, ancient mountain trails and shimmering oases. It is a land where sand dunes stretch to the heavens, palm trees reflect in desert lakes and prehistoric rock carvings decorate the dramatic Akakus Mountains. Rural Libya is characterised by neatly cultivated olive groves, fat lemons dangling from trees and remote Berber settlements. In the cities, merchants sell wares in rose-scented souks, flogging silver, spices, henna, hijabs and Tuareg scarves. The smell of spicy lentil soup and Benghazi seafood hangs deliciously in the air. The population of Libya is mostly of Arab and Berber descent. Berbers make up about 10% of inhabitants and live in more remote areas. The rest of the population lives largely in coastal cities like Tripoli and Benghazi, although recent fighting has forced many to flee. Libyan hospitality is legendary and its people love showing travellers around. But tourism faltered after the Arab Spring and has been paralyzed by the ensuing Civil War. At the time of writing, tourist visas were not being issued and most tour companies have closed their doors – many guides now work as fixers for war reporters instead. It’s impossible to say how current events will pan out, but, like many travellers, we hope the doors to Libya will swing open again soon. 1,759,500 sq km (679,347 sq miles). General National Congress (transitional government) since 2012. Aqilah Salah Issa, President of the House of Representatives, since 2014. Prime Minister Fayez al-Sarraj since 2015. The Foreign and Commonwealth Office (FCO) advise against all travel to Libya, and for British nationals still in Libya to leave immediately by any practical means. This advice has been in place consistently since 2014. Local security situations are fragile and can quickly deteriorate into intense fighting and clashes without warning. Consular support is not available from the British government from within Libya, as consular operations remain suspended. If you need to speak to a consular officer in the UK, call the FCO in London on +44 (0)20 7008 1500. Since 3 April 2019 there has been a significant build-up of militarised forces in the west of Libya. Sporadic armed clashes have taken place to the south and west of Tripoli. Forces opposed to the recognised government have reportedly gained control over a number of towns, including Gharyan (75-80km from the capital). Prime Minister Serraj has announced a state of emergency and full mobilisation of military and security units loyal to the government. On 8 April 2019, Mitiga airport closed temporarily following an air strike. Inter-militia fighting has periodically caused the temporary suspension or closure of airports, closed roads and led to the closure of some border crossings. All airports are vulnerable to attack. Tripoli International Airport has been closed since 13 July 2014. On 15 January 2018, there were at least 20 fatalities and 60 wounded after clashes around Mitiga airport in Tripoli, temporarily closing the airport. Heavy clashes between militia groups in late August and September 2018 resulted in over 120 deaths and nearly 450 wounded. During this period, Mitiga airport was closed for 4 weeks as a result. Terrorists are very likely to try to carry out attacks in Libya. On 25 December 2018, Daesh claimed responsibility for an attack on the Ministry of Foreign Affairs in Tripoli which killed at least two people. On 10 September 2018, a terrorist attack on the National Oil Corporation in central Tripoli killed 2 people and wounded many more. At least 13 people were killed and many injured following a terrorist attack on the High National Election Commission in Tripoli on 2 May 2018. There remains a high threat throughout the country of terrorist attacks and kidnap against foreigners, including from Daesh-affiliated extremists (formerly referred to as ISIL) and Al Qaida, as well as armed militias. Daesh and Al Qaeda have attacked a number of oil and gas installations and killed or kidnapped workers, including foreign nationals. If you choose to travel to Libya against FCO advice, you should consider your security arrangements carefully and take all necessary security precautions, including contingency plans. You should also take out comprehensive travel and medical insurance before you travel. If you’re entering Libya as a media representative, you should get press accreditation from the relevant Libyan authorities. The political situation in Libya remains fragile and the security situation remains dangerous and unpredictable. Since 3 April 2019 there has been a significant build-up of militarised forces in the west of Libya. Sporadic armed clashes have taken place to the south and west of Tripoli. Forces opposed to the recognised government have reportedly gained control over a number of towns, including Gharyan (75-80km from the capital). Prime Minister Serraj has announced a state of emergency and full mobilisation of military and security units loyal to the government. On 8 April 2019, Mitiga airport closed temporarily following an airstrike. Flights are likely to be cancelled at short notice. On 27 August 2018, a militia mounted an offensive in southern Tripoli districts against a coalition of Government-aligned militia. A ceasefire was brokered on 28 August and subsequently broken within hours. Another ceasefire announced on 31 August was broken shortly afterwards. Neighbourhoods have been subject to indiscriminate shelling, including central districts. Reports suggest there have been over 120 fatalities and over 450 wounded, the majority of whom are civilians. A UN-brokered ceasefire was agreed on 4 September 2018, but clashes continued until 25 September. Mitiga airport was closed for 4 weeks during this period, with flights diverted to Misrata. Flights out of Mitiga resumed on 26 September 2018. On 15 January 2018, a militia mounted an offensive against Mitiga Airport in Tripoli, currently held by the Government of National Accord’s Special Deterrence Force (SDF). There were at least 20 fatalities and 60 wounded in the clashes, resulting in a temporary closure of Mitiga airport and damage to the airport and a number of aircraft. Fighting can break out anywhere without warning, including between local militia groups, and many civilians have been killed in outbreaks of conflict in residential areas. There’s a high risk of civilians, including journalists, humanitarian and medical workers, being caught in indiscriminate gunfire or shelling, including air strikes, in all areas where there is fighting. There has been heavy conflict during 2016 and 2017 in several areas, including parts of Tripoli, Benghazi, Zawiyah, Sabratha, Dernah, and in central Libya at Barak al Shati, Sebha, As-Sidra and Jufra. These conflicts include pro-Government of National Accord (GNA) forces, troops under the control of General Heftar, local militias and also extremist groups such as Ansar Al Sharia and affiliates of Daesh and Al Qaeda in the Islamic Maghreb (AQ-M). Derna (1300km east of Tripoli) is under a state of siege by the Libyan National Army with all routes in and out closed, and civilians have been killed in air attacks on the city. Reports of violence, reprisal killings, looting and human rights abuses continue across the country. If you choose to travel to Libya against FCO advice, you should monitor the local security situation carefully. Political events may impact on the security situation. The ongoing political impasse and conflict has seriously affected public infrastructure and services, resulting in power cuts, water, fuel, food and cash shortages, absence of medicines, and high inflation. In June 2017 the UN High Commission for Refugees reported that more than 1.3 million people – including internally displaced people (IDPs), as well as vulnerable Libyans, host communities, migrants, refugees and asylum-seekers – are in urgent need of humanitarian assistance. Power outages can last for 18 hours per day in Tripoli and several days in the South and are affecting mobile phone and internet signals. There’s a very high risk of criminal kidnap for ransom in Tripoli and coastal towns to the West of Tripoli. There’s an elevated risk of kidnap for ransom and arbitrary detention by local militias throughout Libya. Ongoing conflict and the proliferation of armed militias has led to a rise in crime in most areas, including violent robbery, carjacking and kidnapping. Since December 2013, a number of foreign nationals have been shot dead in Libya. Foreigners are also increasingly targeted for kidnappings by both criminal and extremist groups. If you travel to Libya against FCO advice, you should regularly reassess your security arrangements and carefully plan your movements. Take security advice from competent security experts before any travel within the country. Close security protection is extremely important. In the event of a further deterioration of the security situation, routes in and out of major cities and towns may become blocked and airports closed or inaccessible at little or no notice. Don’t advertise your travel or other plans through social media. Avoid routine, vary your travel routes, and keep a low profile at all times. Foreign nationals including journalists are vulnerable to mistreatment by armed groups in Libya. Intimidation, attacks, detentions and kidnapping of local journalists are a serious problem, and a number have been killed. There is a real risk of hostility from those who object to media reporting. Regular, semi-regular and irregular detention of foreign nationals occurs regularly in all parts of Libya. Road travel within Libya remains highly dangerous. There continues to be a risk of being caught up in outbreaks of hostilities. There’s also a high risk of carjacking and robbery. The coastal road between Zawiyah and Tripoli presents an elevated risk. There’s a risk of striking unexploded ordnance off-road. Road traffic accidents are frequent and often result in fatalities. Chad and Niger have closed their border with Libya on several occasions in 2017 without warning, in response to the activity of armed groups in the area. Tunisian border crossings are affected by frequent clashes along the coastal road in west Libya and are often inaccessible. On 31 August 2018 Mitiga airport in Tripoli closed and diverted incoming flights to Misrata following artillery shells striking the airport. It reopened on 7 September but closed again overnight on 11 September following a further rocket attack. On 15 January there were at least 20 fatalities and 60 wounded after clashes around the airport, leading to a temporary closure. On 13 July 2014, Tripoli International Airport was closed following clashes that broke out between armed groups in the area surrounding the airport. Other airports may change their flight schedule without notice. Benghazi airport was closed between May 2014 and July 2017. It’s now slowly reopening to commercial flights but its security provision remains untested. Tripoli Mitiga Airport has been temporarily closed due to nearby violence several times in 2017 and 2018, but usually reopens soon after violence subsides. Due to a number of ongoing safety concerns, the European Union has agreed with the Libyan authorities to continue a voluntary restriction on Libyan airlines flying into the EU. However, some Libyan airlines operate flights to the EU using aircraft leased from other airlines. The FCO can’t offer advice on the safety of airlines. However, the International Air Transport Association publishes a list of registered airlines that have been audited and found to meet a number of operational safety standards and recommended practices. This list is not exhaustive and the absence of an airline from this list does not necessarily mean that it is unsafe. Contact your airline or travel company for further information before travelling. Terrorists are very likely to try to carry out attacks in Libya. Attacks could be indiscriminate, including in places visited by foreigners. Extremist groups including Daesh (formerly referred to as ISIL) are responsible for the majority of attacks, which have targeted foreign and diplomatic personnel and premises, international hotels, commercial and oil installations, and government and other official security institutions. Although GNA- aligned forces, supported by U.S. airstrikes, declared the end of operations against Daesh in Sirte in January, Daesh remain a serious threat to security in Libya. Daesh claimed responsibility for a terrorist attack on the High National Election Commission in Tripoli on 2 May 2018, in which at least 13 people were killed and many injured, and further attacks on the National Oil Corporation in central Tripoli on 10 September 2018, in which at least 2 people were killed, and on the Ministry of Foreign Affairs in Tripoli on 25 December 2018, which killed at least two people. On 24 November 2018, Daesh claimed responsibility for an attack on the central Libyan town of Tazerbo, in which at least 9 people were killed, 5 injured and 20 others kidnapped. On 4 October 2017, at least 4 people were killed and many were wounded in a Daesh suicide bomb attack at the main court building in the city of Misrata. On 23 August 2017, at least 11 were killed in a Daesh attack on a checkpoint in the central Jufra region. On 2 October 2016, a Dutch journalist was killed in Sirte, while reporting on the fighting between pro-GNA forces and Daesh. In Dernah, there’s an ongoing conflict between the Libyan National Army and local armed groups. Terrorist groups in southern and south-west Libya are also of concern and are using the area as a safe haven and transit route. Attacks have been launched in Libya and across the wider region, for example the In Amenas attack in Algeria in January 2013. Armed groups remain largely autonomous due the unstable political and security situation across large areas of Libya. Travel in border regions is especially risky. Regional extremist groups, including Al Qaeda in the Islamic Maghreb, operate in the border areas of northern Mali, Niger and Algeria. They have a proven capability of travelling long distances to carry out attacks, including in neighbouring countries and Libya. There remains a continuing high threat of kidnap from criminal groups, armed groups and terrorist groups across the whole of Libya. Security precautions do not mitigate the threat. Terrorist groups including Daesh, Al Qaeda and their affiliates routinely use kidnapping as a tactic and are capable of conducting kidnapping across borders. Terrorist groups within Libya have both intent and capability to carry out further kidnappings. It’s a realistic possibility that they will target foreign nationals. Criminal gangs also carry out kidnappings, and there’s a realistic possibility that they would sell hostages on to terrorist groups. Foreign nationals have been kidnapped in Libya in the last 12 months. Four foreign nationals were kidnapped in south-west Libya in November 2017 and most recently, 4 foreign nationals were kidnapped in south-east Libya in July 2018. See our Sahel page for information on the regional threat. There is a threat of kidnapping by groups operating in North Africa, particularly from Libya, Mauritania and groups originating in the Sahel. This includes Al Qaeda in the Islamic Maghreb (AQ-IM) and Daesh-affiliated groups, who may travel across the region’s porous border. There is a heightened risk of kidnap in border and remote desert areas of North Africa. Terrorist groups have kidnapped foreigners, government officials and civilians in the region for financial gain and for political leverage. Further kidnaps are likely. Those engaged in tourism, humanitarian aid work, journalism or business sectors are viewed as legitimate targets. If you’re kidnapped, the reason for your presence is unlikely to serve as a protection or secure your safe release. The long-standing policy of the British government is not to make substantive concessions to hostage takers. The British government considers that paying ransoms and releasing prisoners increases the risk of further hostage taking. The Terrorism Act (2000) also makes payments to terrorists illegal. There’s a heightened threat of terrorist attack globally against UK interests and British nationals from groups or individuals motivated by the conflict in Iraq and Syria. Find out more about the global threat from terrorism, how to minimise your risk and what to do in the event of a terrorist attack. If you do choose to travel to Libya against FCO advice, you should pay careful attention to your safety and security. Security precautions don’t remove the threat and FCO advice remains against all travel to the country. There’s a very real threat of kidnap to westerners in the Sahel and surrounding region. The Sahel region includes Burkina Faso, Mali, Mauritania and Niger. The kidnap threat extends to other countries including Algeria, Cameroon, Libya and Nigeria. There is a continuing threat of kidnap following the military intervention in Mali which began in January 2013. Further attacks are highly likely. There are several hostages still being held in the Sahel and surrounding region, some of whom have been held for 3 years. Victims in the region have included construction workers, NGO workers, tourists and diplomats of various nationalities, primarily European. Some hostages have been killed, including 9 British nationals since 2009. The long-standing policy of the British government is not to make substantive concessions to hostage takers. The British government considers that paying ransoms and releasing prisoners increases the risk of further hostage-taking and finances terrorist activity. The Terrorism Act (2000) also makes payments to terrorists illegal. The terrorist threat in the Sahel and surrounding region comes from a number of groups, including Al Qaeda in the Islamic Maghreb (AQ-M) and Al Murabitun, a merger of the Movement for Unity and Jihad in West Africa (MUJWA) and Mokhtar Belmokhtar’s group. These terrorist groups aspire to establish Islamic law in the region and to attack Western interests. Some extremists in Libya are now aligning themselves with Daesh. In February 2015, one such group murdered Egyptian Coptic Christians who had been abducted in kidnappings in Sirte in December 2014 and January 2015. The groups carry out kidnappings of Westerners for financial gain, prisoner exchange and to exert political pressure on governments. Kidnapping for ransom is AQ-M’s primary source of finance. AQ-M and regional Islamist groups operate in the border areas of northern Mali, Niger and Algeria. They have proven capability of travelling long distances to carry out attacks, including in Algeria, Mali, Mauritania and Niger. Criminal gangs also carry out kidnappings for terrorist groups in return for financial payment. Since 2013 terrorist groups in the region have also kidnapped westerners in Cameroon and Nigeria. The main terrorist threat in the region comes from Boko Haram and Ansaru. Boko Haram is an Islamist extremist group in Nigeria that has been proscribed by the UK as a terrorist organisation. Boko Haram regularly mounts attacks in northern Nigeria. Most attacks occur in the north east, particularly in Borno and Yobe states where Boko Haram has its operating base. There have, however, been a large number of attacks in other Nigerian states and further attacks could occur anywhere. Ansaru is an Islamist terrorist organisation based in northern Nigeria, and is proscribed by the UK. Ansaru have carried out a number of kidnap attacks in Nigeria. Boko Haram have taken hostages from neighbouring Cameroon and are consistently kidnapping local nationals and Cameroonians. If you’re taking part in a cross-country rally that travels through the Sahel and surrounding region, you should be aware of the high risk of kidnapping in parts of the region. Some rallies in the 2012-13 season were cancelled or rerouted because of the risk. One of the most famous rallies in the region, the Paris-Dakar Rally, now takes place in South America due to the threat of kidnap. However, other rallies may go through areas where the FCO advise against travel. You should consult our country travel advice when planning your route. You should also be aware that the ability of the FCO to provide consular assistance in some countries in the region is limited. Don’t use cameras close to military or official sites. A Libyan visa issued overseas may not be recognised in some areas, due to the current political conflict. Passports showing previous travel to Israel are not accepted for travel to Libya. All short stay visitors must register with the police within a week of arrival. This is usually arranged by the company you’re visiting or the local travel agency you’re travelling with. If you don’t register, you may be fined when you leave the country. If you choose to travel to Libya against FCO advice, at least 8 weeks before your trip, check the latest country-specific health advice from the National Travel Health Network and Centre (NaTHNaC) on the TravelHealthPro website. Each country-specific page has information on vaccine recommendations, any current health risks or outbreaks, and factsheets with information on staying healthy abroad. Guidance is also available from NHS (Scotland) on the FitForTravel website. Healthcare in Libya is on the whole below the standard available in the UK and suffers from acute shortages in skilled personnel and medical supplies, particularly for chronic conditions such as diabetes. There are private clinics in Tripoli. If you need treatment you may be evacuated to Malta or mainland Europe. Make sure you have adequate travel health insurance and accessible funds to cover the cost of any medical treatment abroad and repatriation. Medical help in remote areas may not be available. Even if your travel or insurance company has arrangements with an international air ambulance provider, they may not be allowed to carry out a rescue operation within Libya. The current status of Libyan rescue services is uncertain. Libya is a cash society. Although the GNA have made efforts to maintain the supply in cash in banks, there continue to be severe shortages of cash and restrictions on bank withdrawals throughout the country. Credit cards are not widely used although Visa and Mastercard are accepted in some places.